Learn how easy it is to make homemade vanilla extract in this post. Learning how to make homemade vanilla extract is really quite simple, and I’m going to let you in on how easy it is! Yes, most extracts contain alcohol and though I’ve seen alcohol-free versions, I haven’t been stoked about using glycerine as the solvent. Considering I use these extracts in small quantities, I don’t have a personal objection to the alcohol content but as always, your paleo is up to you alone to dictate. And certainly if you have to avoid alcohol 100%, then it’s possible to make extracts using glycerine instead. 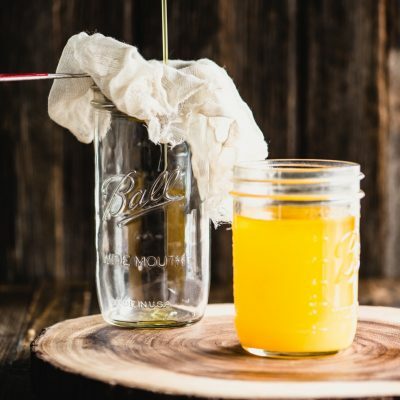 In this post, I’ll show you how to make homemade vanilla extract (and mint and lemon extracts) using the same basic method. You’ll need some sort of alcohol to help extract the organic (carbon-based) compounds that actually make the scents and flavors from the chosen plant material—in this case, vanilla beans, lemon rinds and mint leaves. Did you know that when you smell something, what you’re really sensing are tiny organic molecules that diffuse through the air, attach themselves to the olfactory receptors of the nose and send nerve impulses to your brain? Through experience and learning, you’ve come to associate these molecules with the foods that emit these “smells.” For example, vanillin is one of the predominant carbon-based compounds that makes the scent you know as vanilla. And while it can be synthesized by a series of chemical reactions in a lab, I think you’ll agree that getting it from a natural source is always better. Small organic compounds like vanillin are chemically compatible with alcohol, meaning they’re soluble in it. When you make a homemade extract, you’re taking advantage of that fact. SCIENCE! For best results, remember to steep your extracts for at least 4 weeks before you use them and keep the plant material completely submerged so nothing molds. 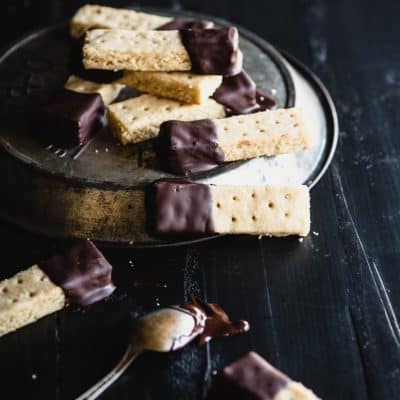 I chose vodka for this recipe but you can use something like bourbon for the homemade vanilla extract, which tends to pair really well. 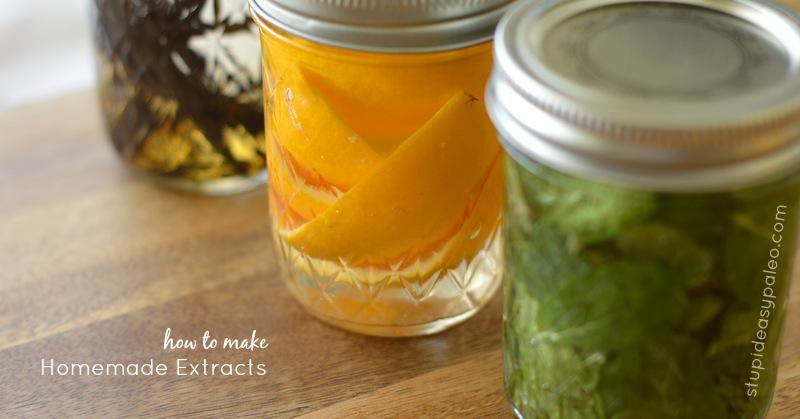 Use these extracts in any application you’d use store-bought extracts. How about using a dash of homemade vanilla extract in my Apple Coconut Pudding or the mint in my Dark Chocolate Mint Coconut Butter Cups? My favorite reason for making homemade extracts is that I know exactly what’s in them. 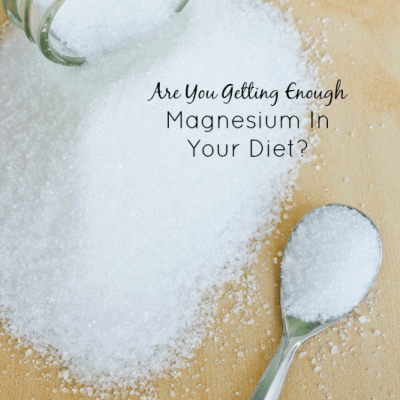 So many of the store-bought extracts contain added sugar or other funky chemical ingredients. These also make fantastic gifts! One note: If you must eat gluten-free, check to be sure the type of vodka you buy is gluten-free. Many are not. I look for vodka made from organic grapes which is a little more expensive but worth it if you can’t have even trace amounts of gluten in your diet. 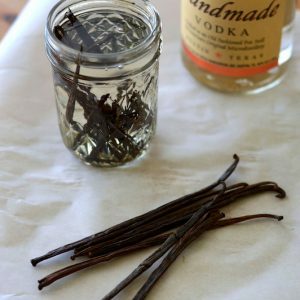 Learn how to make delicious homemade vanilla extract using just a few simple ingredients! No more store-bought. See how easy it is! Using a sharp knife, split the vanilla beans down the middle, lengthwise. Add the beans to the jar. Fill the jar with 1 cup of vodka and cap tightly. Let the extract steep for at least 4 weeks for best results. Shake daily. Hint: If the level of the vodka drops gradually as you use it, add more for a continuous supply of extract. 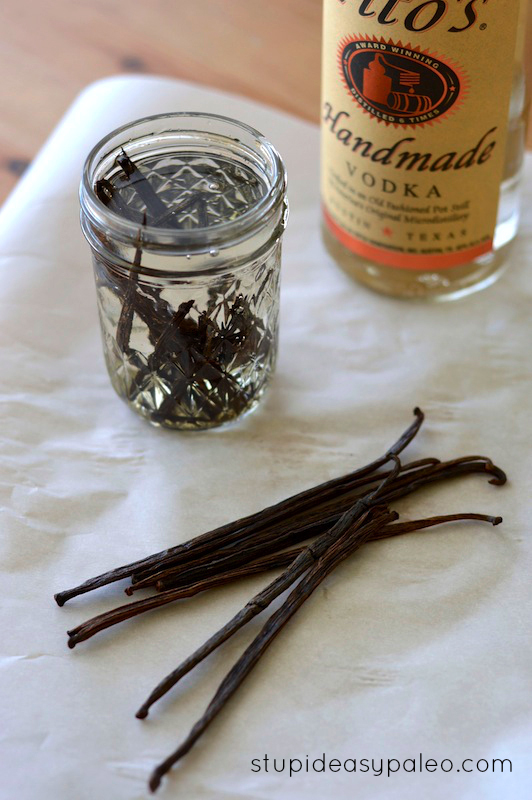 Pin this homemade vanilla extract tutorial for later! I’ve been making my own vanilla for a while–there’s no turning back! I save a lot of money since extract is so expensive, and vanilla beans are reasonable in bulk. I think I’ll try lemon next–looks fabulous! You can probably find them on Amazon or from a supplier like Penzeys. You can also order online at beanilla.com . Great site for many varieties of vanilla beans and other extract materials. This sounds great! I wonder if you could make coffee extract with whole coffee beans. It’s always so good in chocolate treats like paleo brownies! Ohh, great idea with coffee extract! I should really start making vanilla extract, I always see good prices beans at costco! I’ve made my own vanilla before, but found that after I let it sit for almost 3 months it was perfect. It went a little sweet, and had no remaining alcohol smell. I love my alcohol, but not in my morning coffee. Trying a blood orange one right now. Letting it sit longer is definitely better! Huh! I never thought of doing this with lemon or mint. And now I’m I thinking of orange, lime, and maybe other citrus. I’ve considered doing this with cardamom or other warm, solid spices for a while though I keep forgetting to start that project. But I’ve been doing this with vanilla for a couple of years and OH it is LOVELY. I don’t slit the vanilla lengthwise, it seems to take entirely too much coordination. I just chop the beans into about 1/4 inch pieces, about 3 beans per cup, and shake and wait 6+ weeks. My 24oz bottle of vodka has been half used in the last 15 months so it might be time to start another one. :). 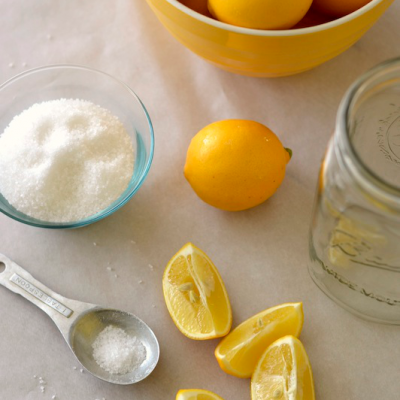 Hmmm…you can finish your lemon recipe by making limoncello! Starts out the same way and is a fantastic aperitif 🙂 I started making my own vanilla last year and I’ll never go back! Hadn’t thought about mint but now I will!! Thanks for the tips! I won’t lie…I was totally thinking of doing that! Awesome! Homemade is so much better! Do these taste like alcohol? I am very opposed to use of alcohol and I want to make my own extracts but I can’t find any without alcohol. 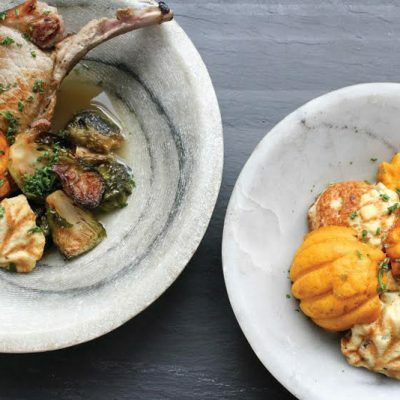 When you cook with it you cannot taste alcohol because it’s usually such a small amount. If you look you can find recipes that make homemade extracts without alcohol but I don’t think the flavor is as good. Just google “non-alcoholic homemade extract” and you’ll see some options. Can we re-extract lemon peel after strain the first batch? Hi there…I don’t recommend it. Fresh will give the best result. I make my own vanilla extract, but never thought about the other two. What would you use lemon or mint extract in? We use mint extract in mint chip ice cream. Where can I purchase the 8 oz jars, I’d like to sell extracts to family & friends. I thought of using baby food jars but cannot fully clean out the covers. Any other ideas of jars I can use. I am excited about making mint extracts since I have lots in my garden – chocolate mint, spearmint and regular mint. So, I’m not quite 21 yet.. if i use alcohol in an extract, is it safe? or should i not even worry since nothing in any recepie uses more than like 1/4 teaspoon of it? It might, yes. Would concentrate the essential oils a bit. After the mint or citrus is made, how long are they good for? I’m sorry, I know this is an older post but I just stumbled on it. What happened to the lemon extract? There are instructions for mint and vanilla but not the lemon and I was really interested in that, as well as the mint. I’ve made vanilla extract so that was nothing new but I’ve not thought to make mint or lemon extract. I have a bunch of peppermint and spearmint growing in my yard and that sounds like a good thing to use it on. That’s why I first visited this site, but when I saw lemon in the title I thought it would be nice to make some of that too. Hey Michele…I think it disappeared off the post for some reason. You would follow similar instructions to the other two, but use the lemon rind instead. Use a sharp knife to slice off the yellow outer skin, avoiding the white pith.